This is one concert not to be missed! 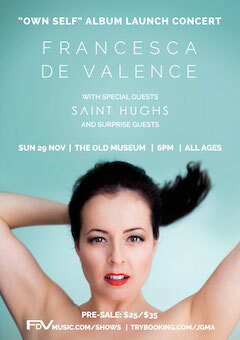 Hear Francesca's epic new album tracks backed by her extraordinary band, string quartet and more at Brisbane's much-loved Old Museum and celebrate the launch of her 2015 Album Release "Own Self". Special guests on the night will be Saint Hughs and the concert will feature other surprise guests.